The winter premiere of Once Upon a Time is just a day away, so to help refresh your memory from all those magic-free weeks, we’ve compiled an enchanting catch-up guide. We also used our powers of penmanship to create a list of the top five things you need to know about tomorrow night’s episode, “The Cricket Game.” Plus, we’ve got a special sneak-peek video of the most recent deadly disaster to hit Storybrooke. Read on for all the fairytale fun below! Where We Left Off: After being trapped in Fairytale Land for eight episodes, Snow and Emma defeated Cora and Hook in an intense (and somewhat sexually charged) battle royale. Emma also discovered she has the ability to do magic. The mother-daughter duo jumped into Lake Nostos, returned to Storybrooke through a well in the forest, and were greeted by an elated Henry, a defeated Regina, and a confused Rumple. Snow rushed over to wake a snoozing Charming from a sleeping curse and with after a sweet kiss packed with the most powerful magic of all, true love, the two soulmates were once again reunited. 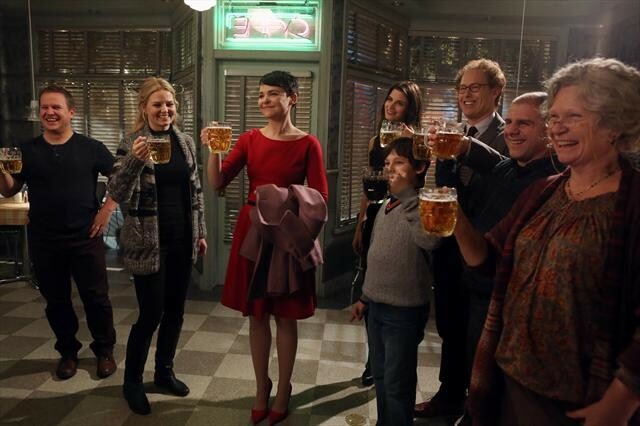 The town rejoiced that the Charming family is now reunited, but Regina is devastated and feels that it’s only a matter of time before she looses Henry for good. Over in Fairytale Land, Hook and Cora used a magic bean to sail their pirate ship through the portals and emerge in a harbor just outside Storybrooke. Dun dun duuuun! Biggest Jaw-Dropper of the Fall: Alright, we’re changing this one to Jaw-Droppers: The first would definitely be watching Emma and Snow ripped away from Storybrooke and thrust into modern-day Fairytale Land. The Charming family had just been reunited with their memories, and each other, so after 28 years of not really being their true selves, it was shocking to see them separated again. The second most jaw-dropping moment of the fall would be realizing that Hook and Cora have found their way to Storybrooke. Can you imagine two more terrifying villains entering our small magic-filled town? Yeah, neither can we. Biggest Letdown of the Fall: Not going to lie, this first half of the season was pretty close to fairytale perfection. No only did we see plenty of our classic tales come to life, and a wide range of terrifying creatures, (Oogres, giants, wraiths and zombies, oh my) we also were gifted with amazing character developments. The mesmerizing transition from a lovesick Regina into the fearless and frightfully wicked magic-wielding Queen is one of the best storylines we’ve seen in a long time. If we had to choose a let down, it would be that there were not enough scenes with Jefferson/The Mad Hatter. Sebastian Stan is a brilliant actor who needs to be promoted to a cast regular ASAP. His subtle facial expressions can instantly change the mood of any scene, and his chemistry with every characters is electric. Plus, he’s just really really attractive. Most Improved Character: Emma. Last season, Emma improved dramatically from an emotionless droid to a fairytale-believing savior and mom. And this fall our blonde badass has once again improved not just as a person, but as a daughter too. For her entire 28 years of life, Emma had always felt abandoned, so when she discovered that her parents are actually the infamous Prince Charming and Snow White trapped in time in a small down in Maine, it’s natural that she would feel apprehensive. However, on her journey through Fairytale Land, Emma began to embrace Snow not just as her friend but as her mother, and in turn Emma’s motherly instincts grew stronger too. Least Improved Character: Henry. Yes, we understand that he is the reason that Emma came to Storybrooke and eventually became the savior, and that’s great and all, but he is still just kind of a dud. He’s adorable and sweet and loves his mom, but his character has not really changed. Plus, watching him eat that muffin while Charming was using his man muscles to mine for diamonds to help get Emma and Snow back was unbearable. Don’t’ just stand there, put down the muffin and help! What We Ultimately Want to See: There are almost too many to list! We want to see more Charming family bonding. Emma to learn how to control and perfect her magic, for Rumple to find his son, and to discover what was in the box that August showed Neal. Not to mention more interaction between Emma and Hook, Emma and Jefferson, and Emma and Neal. 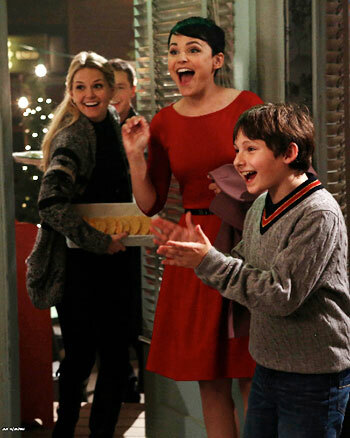 We basically just want Emma to find the perfect fella so that she can be just as happy as her parents are. 5 Reasons You Should Keep Watching: The winter premiere, “The Cricket Game” is jam-packed with numerous reasons as to why you need to keep watching this magical drama, but we’ll go ahead and limit it down to five. 1. Be prepared for the cutest (and sexiest!) Snow and Charming scene you’ve ever seen. If you’ve been separated from your soul mate, what’s the first thing that you would want to do? Just make sure you remember to put a tie on the doorknob first! 2. If you thought Cora in Fairytale Land was frightening, be prepared for a bone-chilling, no-mercy, woman on the loose. Hell hath no fury like a mother scorned. 3. Get excited for some amazing Fairytale Land flashbacks starring Charming, Snow and an incredibly wicked Regina. Have you ever wondered what an execution would be like in a magical realm? Or maybe how Regina got the idea for the curse in the first place? These questions and many more will be answered Sunday night. 4. There will be massive amounts of magic. Someone, you know who I’m talking about, will use magic for the very first time in Storybrooke and the result is both exciting and devastating. Regina will show us that she’s has not lost her magical touch and Cora will scare the crap out of you with what she can do with just the flick of her wrist. 5. There’s going to be a murder. That’s right Storybrooke lovers, one of our sweetest characters will soon loose his/her life but the question is, who did it? Check out our special sneak peak video below to find out who was killed and the unique way Emma and Red are led to the body.